Steven Thachuk is known as one of Canada’s most outstanding and versatile guitarists. Performing works from J.S. Bach and Toru Takemitsu to John Lennon and Radiohead, he consistently challenges the nature of the instrument’s repertoire and boundaries. Playing both traditional classical guitar and a steel string instrument he has appeared in recital, as a chamber musician, and soloist with orchestra throughout North America, Great Britain and Europe. Thachuk has performed most of the major concertos in the guitar repertoire with orchestra and has had concerts broadcast on NPR in America and the CBC in Canada. His playing has drawn critical acclaim. The Westfalen Post in Germany has commented that after his concerts “the audience remains in the seats for a long time, saddened that the concert has ended” and the Nordeste in Mexico has called Thachuk “a master of interpretation and artistry” In addition to many other awards, he received the prestigious Chalmers Performing Arts Training Grant in 1994. An avid supporter of new music, Thachuk has premiered numerous works by composers such as Gerald Garcia, Liviu Marinescu, Elisabeth Sellers, Robert Baker, Denis Dion, Luke Mercier and Scott Adams. In 2007 he appeared as soloist with the Pacific Symphony and Chorus in Oswlado Golijov’s Oceana with Grammy Award winning guitarist John Dearman. Thachuk has also given the world premiere performances of Gerald Garcia’s Heart of the Rose-Concerto for Guitar and Orchestra, in Manchester, England and Scott Adams’ Eurasia for Guitar and Orchestra in New York. Capstone Records released his performance of Liviu Marinescu’s Pastiche in 2008. In addition to his performing career, Thachuk has an international reputation as a leading teacher and pedagogue of the instrument. He is much in demand for masterclasses and concerts at universities, conservatories, and major guitar festivals throughout North America and Europe, most recently teaching at the Guildhall School for Music and Drama and the University of Surrey in England. In 2002, Steve Thachuk was appointed as Professor of Guitar and Chair of Guitar Studies at California State University, Northridge. Previously, he has served on the faculties of the University of Toronto, the Glenn Gould Professional School at the Royal Conservatory of Music and Queen’s University. Thachuk also serves on juries for many major international guitar competitions. In 2008, he was appointed to the Council of the MusikAkademie in Koblenz, Germany. Steven Thachuk’s studies began when he was eight years old. He pursued his undergraduate degree at the University of Toronto, and continued his studies in Germany and at the Eastman School of Music in Rochester, New York, where he completed his doctorate degree in 1998. Thachuk regularly collaborates with other artists. He performs with flutist Sarah Wass and is a member of the experimental music ensemble Freshly Squeezed. 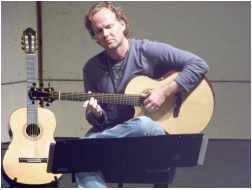 He also appears in duo concerts with American fingerstyle virtuoso, Michael Chapdelaine. Thachuk is also a member of the Meyer/Thachuk Guitar Duo. In 2009, he toured with Jeff Young (Megadeth, Badi Assad) and Scott Morris in the USA and England). This trio formed the basis of Line Forms Hear, an eclectic guitar trio whom Thachuk toured with alongside Morris and Julian Coryell. Recent highlights of his performance career include solo appearances with the Pacific Symphony, Surrey Mozart Players, ProArte Chamber Orchestra Colorado, Fort Wayne Philharmonic, Lancashire Chamber Orchestra, Toronto Sinfonietta, Quinte Symphony, Prince George Symphony Orchestra, and the Toronto Philharmonia, as well as concerts and masterclasses throughout the world. Thachuk has released two CDs, Evocacion, with the Meyer/Thachuk Guitar Duo, and Currents, a solo recital CD of 20th century guitar works. Steven Thachuk is a BMI composer and lives in Los Angeles and Toronto.